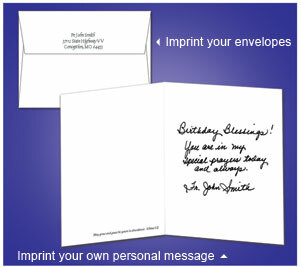 Save time while giving your cards a personal touch! Most of our greeting cards, notes, holy cards, prayer cards, bookmarks and envelopes can be imprinted with your name, signature, address or a personal message you've created. Assorted collections cannot be imprinted. How do I order imprinted items? On some items, you may also be able to add an imprint to an item already in your cart by clicking the "Add Imprint" button under the product description in the cart view. We will choose type sizes to fit your text into the space allowed. Imprinting will be done in black ink. Cards are normally imprinted on the inside right panel below the card text. Envelopes are normally imprinted on the back flap. If you wish a different location, please tell us in your special instructions. Please be complete and accurate in your instructions. We guarantee our work, but errors cause wasted labor, paper, and most importantly, time. If you want an estimated delivery date for imprinted items, please call us at 800-889-0105. For Christmas card orders after November 25th, please specify a second design choice in the Special Instructions section. Looking for that perfect card? Create your own! Customize any Printery House card for only $19.99. This fee covers all setup charges when you start with a card or other item as advertised by The Printery House and request changes to it, such as removing or replacing the inside text of a card. The price of the cards themselves is not included. Please email sales@printeryhouse.org for more information. Digital offset printing gives The Printery House the ability to produce quality full-color documents up to 12.5" x 18.5" in size in any quantities. This is in addition to our four-color offset press, which can produce full color documents in larger quantities and sizes. We are now able to offer even more to our faithful customers. We would like to have the opportunity to bid on your next custom printing needs. What can The Printery House do for you? Use Printery House designs with your own personalized message. Use your own artwork and personalized message. All information is required except for email address. After you submit the form, someone will contact you. Please check the box to verify that you are not an automated robot. Many Scripture translations and Bible texts are under copyright. 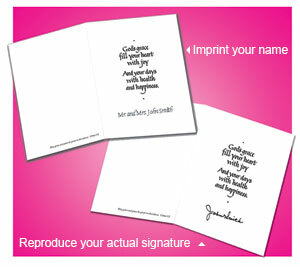 The Printery House must verify the publisher's reprint policy before using Scripture texts on personalized products. Please see Bible Copyrights for more information.